My ABC Along entry for D is dishcloths. Cotton dishcloths are much more sanitary than sponges. They're fun to make and easy. They make great gifts. My hairdresser is still raving about hers! The body of the sweater is ready for steeking. 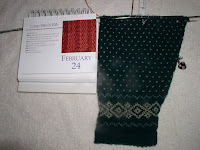 I just need to finish a sleeve to know how long to make the sleeve steek. The sleeve is about 10" now, but each row gets longer for a while. The finished sleeve will be about 20 1/2" long. A long way to go, and lice pattern is not as interesting as the other patterns. The upside is that 3/4 of the rows are just knit in one color. This is working well for the sleeve increases. I'm increasing every 4 rows and the lice pattern is an 8 row pattern. I am putting the increases in the row before the lice. It's a lot easier than increasing in the pattern at the wrist. When the sleeve reaches the target width, I'll work straight up to the shoulder seam. What is all that stuff on the top of the sleeve? The sleeve is too big around for the dp needles, so I added a circular. There are 3 dps and one circular on the sleeve right now. I really need a 2nd circular, which is on order from KnitPicks. The side marker is where I started on Sunday morning. It helps to know how much progress I've made. It is on a circular earring finding. The other marker is at the start of the increases and makes it easy for me to count how many I've done. DH and I celebrated a wedding anniversary. We've survived another year together! Sometimes this surprises us how long we've been together. We went out for a nice dinner in a place we haven't eaten in for quite a while, an Irish place called Jimmy O'Neill's. We both had corned beef and cabbage. My portable knitting project is socks for DS. 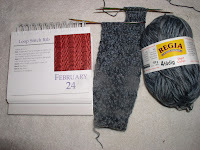 The yarn is Regia 4 fadig Short Color in greys. The leg pattern is a k2, p2 variation adapted from Charlene Schurch's Simply Sensational Socks book. I'm working the heel flap on the first sock. I like to keep a sock on the needles. I'll be doing men's socks this year. 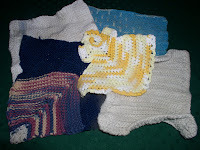 I knit for all the women for Christmas gifts. This pair may be a birthday gift.